Buffalo Wild Wings | Who's Cooking for Kacey? It’s never dull when family gets together. Mine is no exception. No matter what the combination, just a couple of us, or the whole bunch of 8 siblings, we definitely make memories. 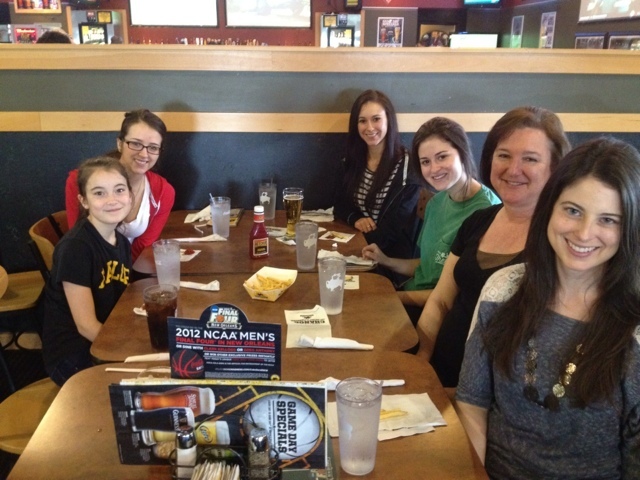 Kelly (sister #4, striped shirt) spearheaded today’s get together at Buffalo Wild Wings. And Danny and I were lucky enough to get an invite. Apparently, Kelly likes hot wings. 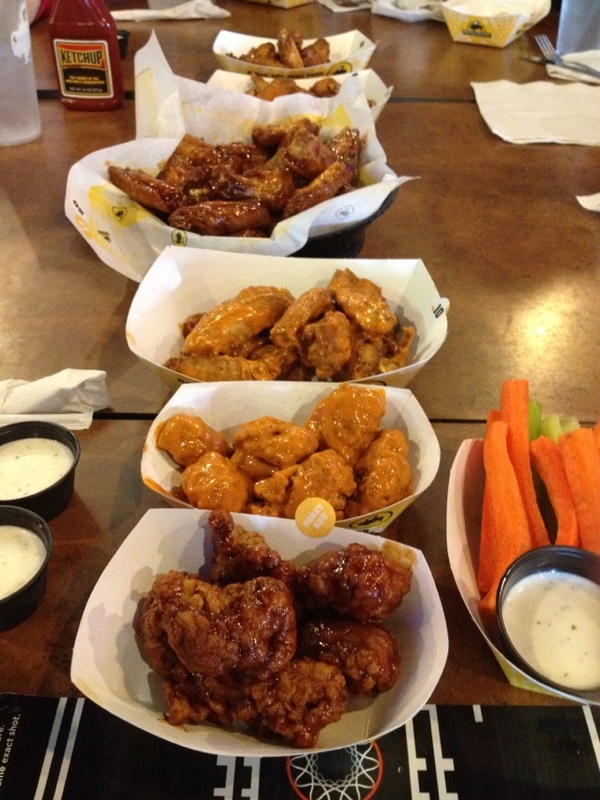 I did not realize she was such a wing lover until today. She did the ordering and I gladly sat quietly and waited to see what new flavors would be headed our way. Kara (#6, in green) and Kamryn (#7, in red) were not having any of the traditional style wings; they prefer their chicken bone-free, chicken-nugget-style and chose that option. For the rest of us, it was Honey BBQ, Mild, Jammin’ Jalapeño, and a rub of Buffalo (this one was not saucy, but it turned out it was one of our favorites). I also really liked the sweet, spiciness of the Jammin’ Jalapeño. Turned out these four flavors made a pretty good combination. Not too spicy, in fact, I didn’t eat very much ranch with these, as I wanted to get the full effect of the sauces. I’m sure if I would have ordered a super hot sauce, I would have more heavily relied on the coolness of the ranch to cut the bite of the heat. 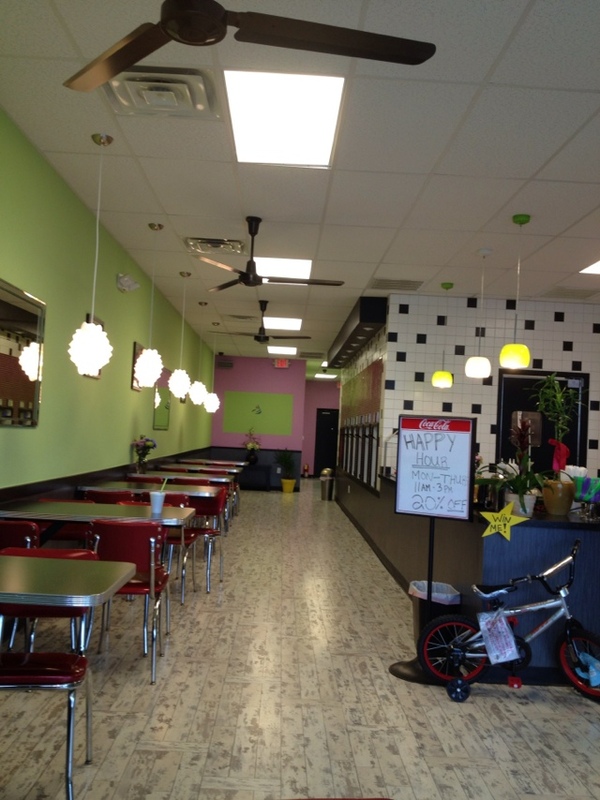 I preferred to wait to the end of the meal and cut the heat a sweeter way…with frozen yogurt. 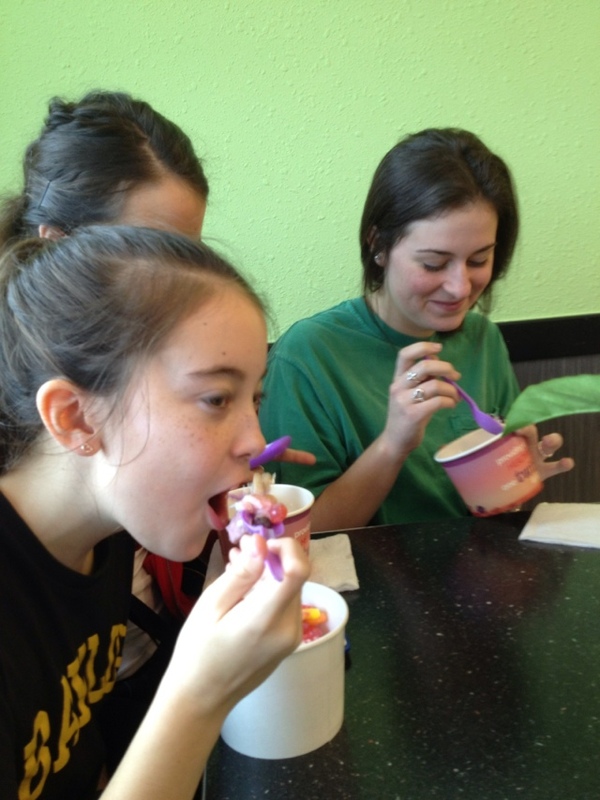 Good thing a Purple Berri just opened in Waxahachie (by Subway and Domino’s) and my sisters did not need much convincing. The decor was fresh and colorful and included visually interesting chandeliers that just so happened to photograph well. 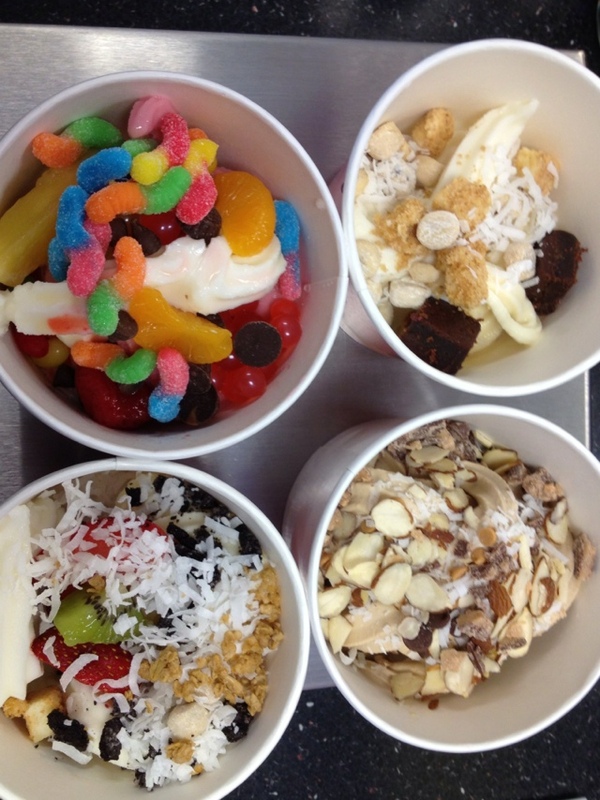 Kara, Kamryn, KaLynn and I went to work deciding which flavors we wanted to grace the insides of our bowls. My favorites were the peanut butter and the white chocolate mousse, and since they were side by side in a machine, it made it easy to swirl them together. Peanut butter should always be topped with chocolate, so I added chocolate and peanut butter chips, coconut, almonds, and a tiny scoop of heath bar. I would have added Reese’s Peanut Butter cups, but they had the AWFUL, new, super tiny cups (Reese’s Minis) that have more waxy chocolate than peanut butter. These are served up intact since they are too small to chop up, which means that when added to something cold like ice cream, it becomes super hard and your tongue can’t even melt the chocolate enough to get a good taste. It’s a complete waste and I’m quite disappointed as you can tell. I’m hoping that these new extremely tiny Reese’s Minis get discontinued and fast…they are ruining things for me, yogurt-wise. It’s to the point that I’m seriously considering chopping up my own regular size Reese’s cup and topping my peanut butter froyo myself. I really hope it doesn’t have to come to this. Enough of my peanut butter rantings, the bottom line is that Purple Berri yogurt is good and from what I can tell, the flavors don’t have the artificial-ingredient-after-taste. A huge plus in my book. We filled up our bowls (bet you can’t tell who made the colorful bowl 😉 and laughed and giggled like we were all 10 again.